The Sea To Sky Gondola just outside Vancouver is truly a world class attraction. Get ready for stunning 360 degree views of high alpine vista views! The Sea To Sky Gondola just outside of Vancouver on the way to Whistler is a must. Looking up from the parking lot I knew the view was going to be impressive, but not THAT impressive! The expression on my kids faces when experiencing new outdoor adventures are priceless. I don’t know about you, but as a parent one of my biggest joys in life is seeing my kids faces light up. 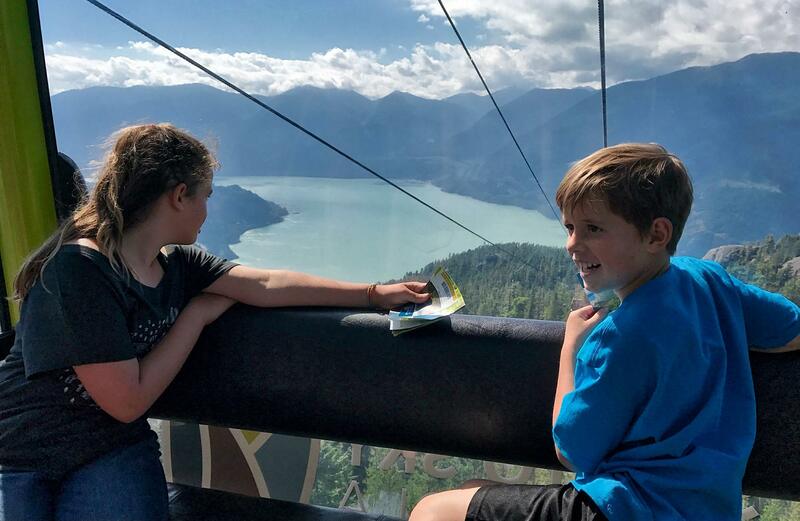 If it wasn’t for the Sea To Sky Gondola, young families like mine would never be able to enjoy this mountain experience together. The Sea To Sky Gondola did not disappoint. Smiles from ear to ear, and giggles of pure excitement filled our gondola cabin as we climbed higher and higher. The ride was so smooth and quiet it literally felt like a dream flying up the side of the mountain. Everyone was loving the ride as the views kept getting more impressive with every passing moment and foot of elevation climb. Well, everyone except Gretta… I noticed she looked a little like Han Solo when he was frozen in carbonite. I honestly keep forgetting she has a mild fear of heights. Nothing like soaring up a mountain side going 3000 ft in 10 minutes to help with conquering that fear. Okay… I’m not that insensitive. I held her hand and stopped the kids from rocking the gondola as we jostled about taking in the most breathtaking and stunning views. The gondola ride was just the beginning of our Sea To Sky Gondola adventures that day. We couldn’t believe our eyes at what came next as we reached the first viewing platform at Summit Lodge. The Sea To Sky Gondola is the quickest and most comfortable way I know for the average person with any level of physical ability to get to the top of a mountain. Take in the alpine coastal range beauty of super natural British Columbia in just minutes. The staff are friendly, the equipment is state of the art, and all you need to do is sit back and take it ALL in. The Summit Lodge Viewing Deck is the first of the three viewing platforms that you encounter. This magnificent 5,000 sq/ft deck offers breathtaking views of Howe Sound, our coastal mountain range, and the famous Co-Pilot and Sky Pilot mountain peaks. The Chief Overlooking Platform stretches out over a cliff edge with a sheer drop-off beneath you. Access this viewing platform from the middle of the Panorama Trail. It’s about a 15-20 minute gradual hike from the Summit Lodge and Sky Pilot Suspension Bridge. From this platform you can look out and see the famous Chief mountain and watch the windsurfers and kiteboarders way down below in the waters of the Howe Sound. The Spirit Viewing Platform is the place to go to get more stunning views after walking across the suspension bridge. You can even get married on this viewing platform! Imagine those wedding photos ladies. The capilano suspension bridge in Vancouver must have had suspension bridge envy when this new Vancouver area attraction opened. 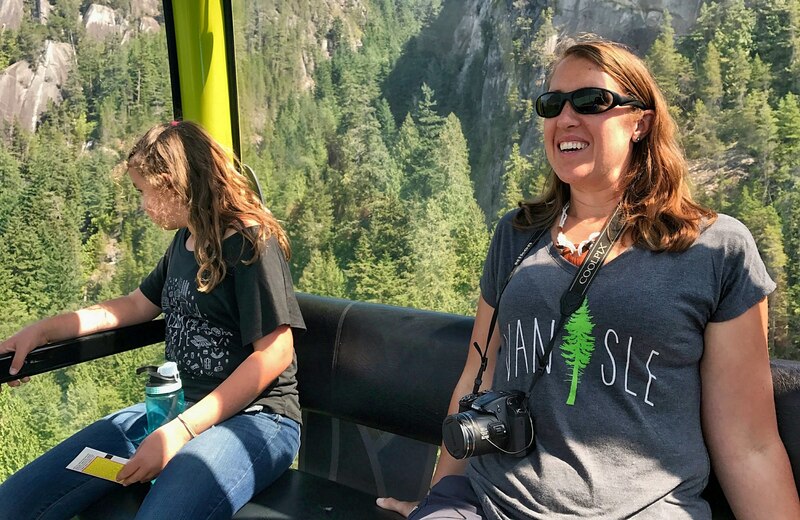 I’m not saying that you shouldn’t experience both suspension bridges… it’s just that the Sea To Sky Gondola suspension bridge is up a mountain, thousands of feet over the earth below, with 360 degree views of high alpine mountain scenery both near and far. The views are stunning and it’s not like these mountain top views are something you see every day. For years these trails and vista views at the top of the Sea To Sky Gondola were only accessible to the hardened hikers who made the hours long gruelling journey to the top. Now this extensive hiking and walking trail network is available to all. It would be a shame to take the Sea To Sky Gondola to the top and not spend some time enjoying all there is. Plan for at least a couple hours to walk around on the best maintained trails for mountain walkers I’ve ever come across. Choose from the Front Country Trail, The Panorama Trail, The Spirit Trail, and the Lookback trail. Whatever you do, don’t miss the Panorama Trail. Visit the Sea To Sky Gondola website for a full list of the hiking trails to choose from the 11+ more popular longer hikes. In just moments you’ll be looking out at one of the most beautiful vista views the BC Coastal range has to offer. If you thought your days of hiking on the top of a mountain were over think again. 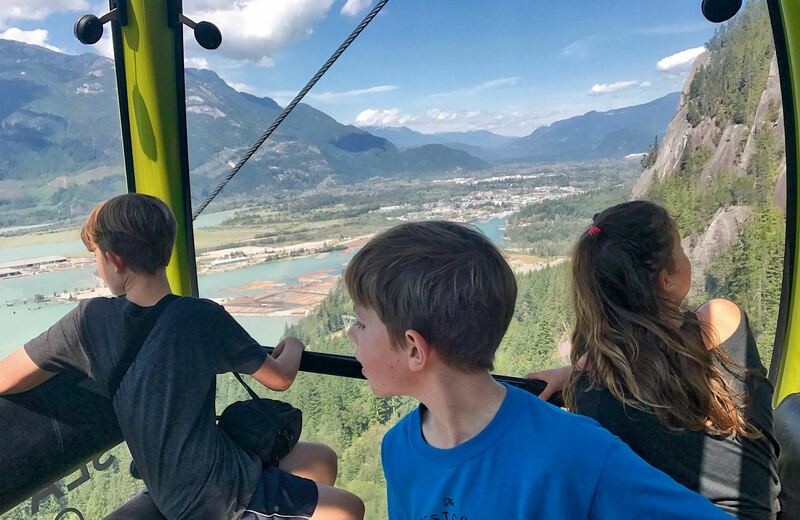 The Sea To Sky Gondola is guaranteed family memories just waiting to happen. Don’t be left looking up from the parking lot wondering if it’s worth it. If it’s a nice, clear, beautiful day it’s always worth it. Hours Of Operation: Open year-round with seasonal open and closing times. Ticket Prices: Adults: $40, Youth (13-18): $25, Child (6-12) $14. There’s a family pass too. Save a few dollars and buy your tickets online. Pet Friendly? Yes, you can bring your dog with you for a fee. Is The Sea To Sky Gondola Accessible? Yes, the gondola cabins are wheelchair and stroller accessible. The Summit Lodge and viewing deck is also accessible (weather conditions permitting). Are there Food & Beverages at the top? Yes, in fact there are three different venues to choose from to satisfy your pallet. Is There A Shuttle From Vancouver? Yep, for a fee. Here are the Sea To Sky Shuttle Details. Traveling From Vancouver Island? Take the Departure Bay Ferry from Nanaimo to the Horseshoe Bay (West Vancouver) It’s about an hour drive from there. • Bring water bottles and plenty of snacks along with your bag lunch. You’ll end up spending way more time on this attraction than you think. When you get to the summit you’ll see it’s way more than a mere gondola ride. • If it’s a hot summer day break up your time so the sun doesn’t drain your family’s energy and cut your time short. Bring sunscreen, sunglasses and hats. I know this should go without saying, but it’s HOT at the top of a mountain during the summer! • Don’t miss Shannon Falls just a 15 minute walk away from the base of the Sea To Sky Gondola. Ask one of the staff to point you in the right direction. If you have the time it’s worth the walk over through the woods to take in the towering waterfall.